Corcovado National Park is centered around a broad lowland plain on the western OSAPeninsula that prominently features the approximately 1000-hectare freshwater Corcovado Lagoon comprising a large swamp that is seasonally replaced by grasslands. The boundaries of the park extend into the surrounding mountains and include the watersheds that drain into the basin. The park highlands include the peninsular divide as well as portions of watersheds Tigre, Agujas, and Rincon Rivers, mainly that drain to the Golfo Dulce as well as those draining to the Pacific. Elevation varies inside the park from a low of sea level to the highest point on the peninsula, Mount Muehler at 745 meters above mean sea level. 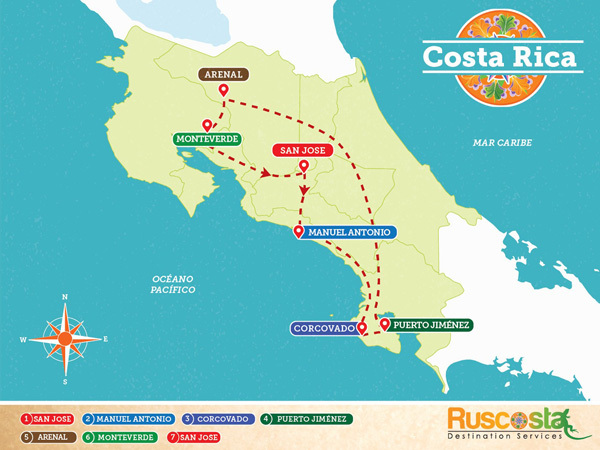 Tour to Corcovado National Park Included. Tour to Caño Island Included. Puerto Jimenez is a genuine rootin tootin frontier town located on the Osa Peninsula. The pueblo itself is divided on a grid of dusty dirt roads where one will find a wide variety of bars with a modern day saloon feel. Of course, there are also plenty of little sodas (mom and pop restaurants) and little shops. Most people travel to Puerto Jimenez on their way to Corcovado National Park and use it as a place to fill their canteen or stock up on supplies. The town is the last piece of civilization before entering into one of the world’s wildest jungles. 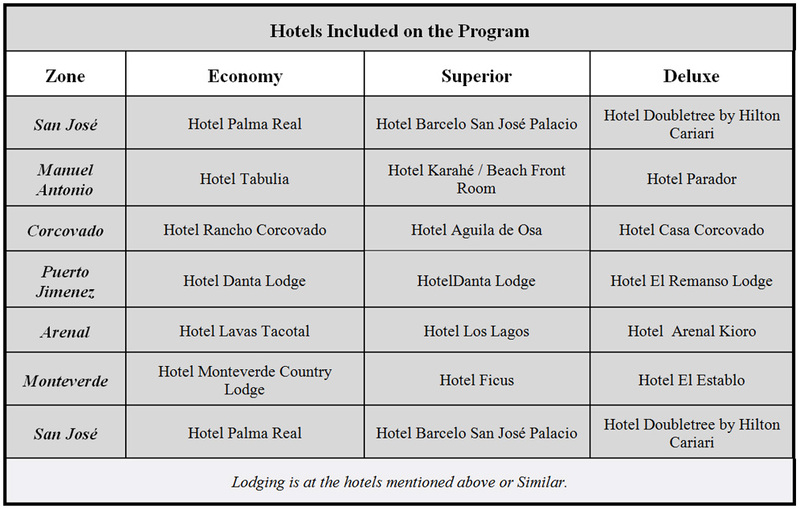 After breakfast, you will be transfer to Puerto Jimenez Domestic Airport. Regular transfer Included. At your arrival at Puerto Jimenez you will take the domestic flight to San Jose to the International Airport. The community of Monteverde is located in the wet and windy Tilarán Mountains of Costa Rica. Quakers, biologists, educators and landowners – has shown a great deal of commitment to maintaining the integrity of this forest. Over the years, scientists have gone there for research purposes, birdwatchers and photographers have delighted in seeing such inhabitants as the Resplendent Quetzal, and hikers have wandered on trails through its vast greenness. Arrival to San Jose hotel, for the last night of lodging. Day 15 – San José – International Airport. Reservations must be subject to availability at the moment of the reservations.